Need help choosing a Rock Drill? Select the "Choosing a Rock Drill" tab. 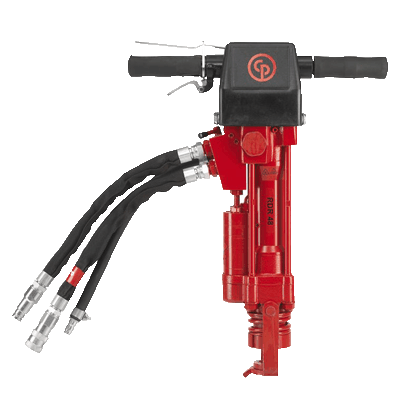 First – it is important to understand that a percussion rock drill does not cut through rock. Each blow shatters the rock in front of the bit - the steel and bit then rotates slightly and it shatters new rock while air is blown down the center of the drill steel clearing the bit face and blowing the chips up and out of the hole. This happens several thousand times per minute in some cases and is much more effective than electric drills or core drills in rock and concrete. The first thing you want to determine is the hole diameter and depth you want to reach. Make sure your air compressor is capable of providing the amount of air (CFM) you require. The baby drills can effectively drill ½” to 1-1⁄8” diameter holes 18” deep, and only consumes 20 CFM. As you step up in drill class you can step up in hole size and depth. 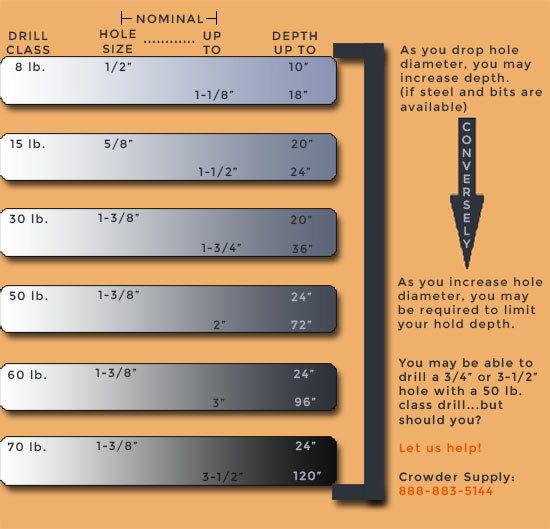 In some cases you can drill holes even smaller or larger than the drills recommended limitations (see chart) but we would prefer to talk with you before making these recommendations. Crowder Supply 888-883-5144. Hardness of rock or concrete and the drilling conditions can vary widely and you may require a smaller or larger drill for your conditions. Few would disagree that it is always better to have more power than what you need – than to not have enough. There is always a tradeoff. Buying a light drill will be easier to handle but you will have to handle it for a longer period of time.